The sides meet at the Gaelic Grounds tomorrow night. Limerick's Sean Finn and Clare's Aron Shanagher will face each other. CLARE HAVE NAMED four players who have tasted senior championship action this summer in their side for tomorrow night’s Bord Gáis Energy Munster U21 hurling semi-final against Limerick. Centre-back David Fitzgerald and full-forward Aron Shanagher both started in Sunday’s Munster senior final defeat to Cork. Midfielder Jason McCarthy came on as a substitute in that game while centre-forward Ian Galvin, a brother of Colm, cane on and scored a point in last month’s senior semi-final success against Limerick. 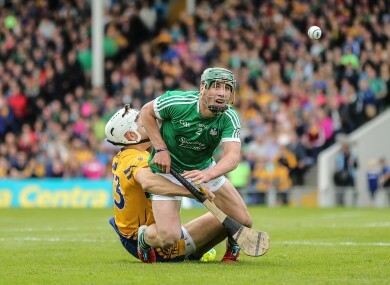 Limerick boast a strong side who blitzed Tipperary with a 2-24 to 0-19 victory in their quarter-final tie. They have made a single change from that game as Thomas Grimes comes into the side at left half-back and Josh Adams drops to the bench. Six of their team featured for the Limerick senior side in their championship exit at the hands of Kilkenny last Saturday week. Corner-back Sean Finn, centre-back Kyle Hayes, centre-forward Cian Lynch and corner-forward Peter Casey all started that game. Captain and full-forward Tom Morrissey came on as a substitute, as did corner-forward Barry Nash. Throw-in at the Gaelic Grounds tomorrow night is 7.30pm. Poll: Who do you now think will be crowned All-Ireland senior hurling champions in 2017? Email “4 senior players in Clare U21 side as Limerick make one change for Munster semi-final”. Feedback on “4 senior players in Clare U21 side as Limerick make one change for Munster semi-final”.